Nisbets Catering Equipment Blog - Industry news, trends, recipes and more! 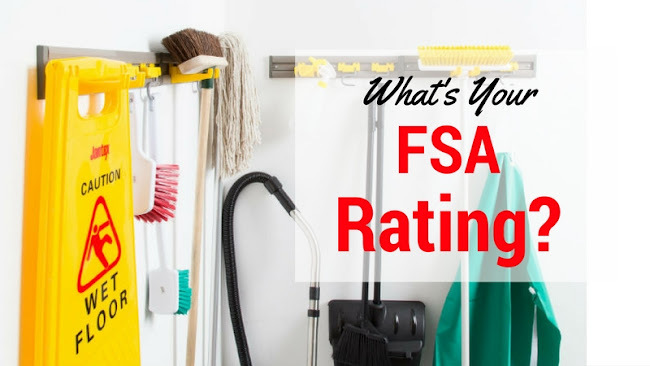 : What's Your FSA Hygiene Rating? What's Your FSA Hygiene Rating? Keeping staff members up to speed with the latest hygiene standards is an essential task in hospitality and food service areas caterers can't afford to ignore. The importance of excellent hygiene is paramount and using the right cleaning products can have a huge impact on the levels of hygiene dining outlets are able to achieve. The future possibility of operators having to display their FSA Hygiene Rating has made aiming for a five-star rating even more important. And the use of colour-coded cleaning products can really help with the easy and efficient maintenance. The very process of designating colours to cleaning equipment in certain areas of an establishment significantly reduces the spread of bacteria and prevents cleaning products being mixed up. The Jantex range of colour coded products includes everything from labels and spray bottles, to bins and mop buckets. One of the most popular collections from the range is the 750ml plastic bottles with colour coded heads that makes identification easy, ensuring that the correct products are always used. Millilitre levels are clearly marked on the bottles and will help with diluting chemicals safely whilst avoiding waste. The Jantex range also includes a selection of natural latex gloves available in small, medium and large. The gloves come in pink, blue or yellow, so that different colours can be worn when cleaning specific areas and surfaces. Ideal for use when cleaning, washing or preparing food, and designed to protect hands and skin from oils, harsh chemicals and hot liquids; the gloves are both lightweight as well as durable. With so many different areas to keep clean, it’s important to stick to a thorough cleaning regime in order to reduce the spread of bacteria. Thankfully, with the Jantex Pro range caterers can be confident that they can achieve an ultra-clean and hygienic finish whether in the kitchen, washroom or front of house. Formulated using highly concentrated commercial cleaning chemicals Jantex Pro boasts an extra strength formula that gets to work at once, targeting the worst grime and bacteria in seconds. Even a small amount of the highly effective formula is enough for a long lasting and professional clean. The Jantex Pro Sanitiser is available in a handy trigger spray bottle or 5 litre container. This high-performance, non-fragranced and ready-to-use kitchen sanitiser is ideal for food preparation and serving areas. Containing active biocides which eliminate all types of soiling, the advanced, fast acting formula powers through germs on kitchen surfaces, appliances and walls, leaving food service environments hygienically clean. The formula has also been EU accredited to ensure that 99.9% of germs and bacteria are killed in just 30 seconds, so you don't have to waste any time at all. And if caterers are washing up manually but still want to ensure outstanding results every time then the Jantex Pro 5ltr Washing Up Liquid is perfect. This concentrated, low foaming liquid boasts highly active detergents that can power through grease on even the dirtiest of pots and pans – removing heavy soiling regardless of whether you are in a hard or soft water area and ensuring grease and grime is not re-deposited on any items. The range also includes dishwasher and glasswasher detergent, rinse aid, washroom cleaner and thick bleach. For more information on colour coded cleaning take a look at our colour coded cleaning guide.